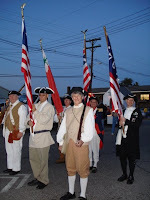 These two photos taken at the 2009 West Side Nut Club Fall Festival Parade of the Captain Henry Vanderburgh Chapter of the Daughters of the American Revolution. Photos submitted by Vannetta McDowell. 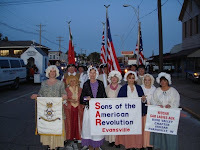 These two photos at the 2009 Fall Festival Parade are of the Ohio Valley SAR Chapter of the Indiana Society of the Sons of the American Revolution. Photos taken by Cheri Baumberger & submitted by Don Counts.